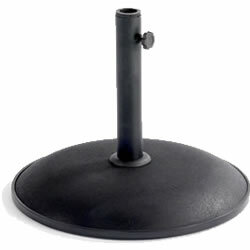 Made by Hartman as part of the Amalfi range, this parasol base has been specifically designed for the Amalfi parasol. It has a hefty 15kg weight, enabling it to hold up against strong winds. The corresponding parasol can be seen here. Other items from the Amalfi range are available to view here. It has a hefty 15kg weight, enabling it to hold up against strong winds, and has been given a bronze finish to match the rest of the Amalfi series.